Griffon Alpha Group offers Security Mobile Patrol Service, a cost-effective security solution suitable for when your premises is equipped with adequate security devices and equipment such as CCTV, security alarm systems and proper fencing, thereby eliminating the need for a static guard. If you have great need for security services but are going through budget constraints, you can utilise our security mobile patrols service. They can supplement the security measures you have in place, such as security warning signs and perimeter fencing to provide a strong deterrent to potential offenders. Additionally, Security Mobile Patrols can address potential risks and threats in your premises. They are trained to identify potential fire hazards, heavy water leakages and even unsecured company information and systems. Our mobile patrols perform comprehensive external and internal perimeters inspections, physical checks of doors, windows, gates, vehicles and machinery, storage containers and rooms and theft-sensitive areas. They will also check for trespassers, graffiti or other damages. You will be immediately informed of any irregularities at the site such as, storm damage, vandalism or signs of an attempted break-in. 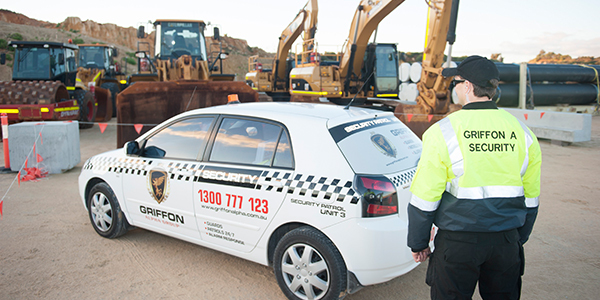 Griffon Alpha Group operates a large fleet of marked security patrol vehicles in all areas between Yanchep and Mandurah. Each of our security patrol unit is equipped with the tools needed to perform inspections of our Clients’ property. These include spot lights, Guard Tour Management system, radio and mobile communication facilities, GPS tracking device, Video/Voice recorder, computer and Internet access.